A few days ago several things happened. One, Emily vanished and two, George caught something big in his web. I was very concerned about Emily, she hadn't been spinning webs for a while, opting instead to just hang on one small patch without moving. I got a flashlight and Roswell and I went over every square inch of the porch (Roswell assisted chiefly by chasing down and eating a large moth that looked like a piece of bark). I was worried that Emily had gone outside where it would be very difficult for me to find her and where it would also be a lot easier for something to eat her. 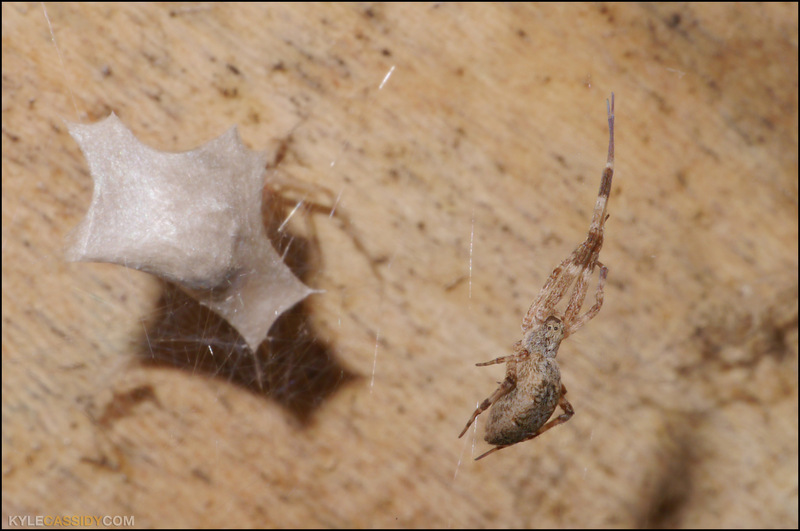 After an hour and a half I gave up and, with great sadness, went and took some photos of whatever it was George had in his web. It was leaf shaped and thick in the center, sort of like an irregular flying saucer. While I was doing this, I saw little feet moving behind whatever it was -- Emily was on top! cocooning it in silk! Wot Wot? I ran inside and googled "feather legged orb weaver egg sac". Boom, a photo popped up of exactly the thing I was looking at. I went back and examined very closely the things that I had thought were her eggs, they were small, onion shaped, and under extreme magnification I could see there was a tiny hole in each of them -- whatever was in them had already hatched. Like the Nazi's at Tannis, I'd been digging in the wrong place. Over the course of the next day or so she made three egg sacks, all leaf shaped and fat in the middle, hanging around the web in a circle. Sometimes I'd come out to find her sitting on one, and other times I'd come out and find George sitting on one. I'm not sure if they were actually doing anything intentions by sitting on them (i.e. guarding them) or if it's just a nice spot in the web to sit in. I also can't tell if they have two webs near one another, or one web they're sharing, but she moved several feet to be closer to him. I still haven't been able to find a good book about Uloborus spiders, so I'm mostly in the dark as to what's going on. Will her eggs hatch soon? Or will they over-winter? Are there things that eat Uloborus eggs that I should be watching out for? What will the little spiderlings eat? How many babies will she have? Will I need to buy glasses for a two hundred kids with eight eyes each? A though for "our" Gipsy, a Pholcus phalangioides, that spent all winter with us in a corner of the living room. It left us last month. I wonder if your spider expert who identified Emily and George for you would know. Kyle, you lead a life crowded with incident! Wow, his front pair of legs are huge! They're like twice as long as his body. Are Emily's similar? yes, they're very similar, except emily is larger and george's pedipalps are different. I love how he's all... casual legs crossed, readin' the news, chillin. in lieu of a scientific text, re-reading Charlotte's Web couldn't hurt. clearly, it's excellent spider-rearing advice. Is there anything I can do to assure the health of 500 baby spiders?!? Maybe a cream of a poultice? Or a spell?